It’s time to sign up for the annual Lorain Sports Hall of Fame Golf Outing. 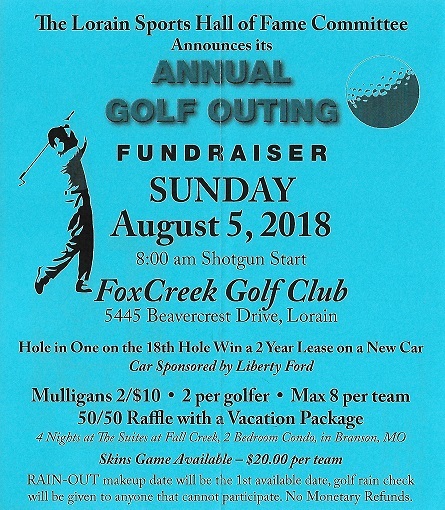 The 2018 outing will be held on Sunday, Aug. 5, at the Fox Creek Golf Club, 5445 Beavercrest Dr., Lorain. It’s an 8 a.m. shotgun start for the foursomes event. Cost is $75 per person, which includes 18 holes of golf, a cart and refreshments, plus lunch at the turn, and a steak dinner afterward. Hole sponsorships are available for $60 and are a great way to promote your business or organization. You can download a registration form and information flyer by clicking this link. Otherwise, to sign up, or get more information, call Bambi Dillon at 440-989-6539, Jim Turton at 440-225-9555 or Ron Feldkamp at 440-244-3449. We look forward to another great day of golf with you on Aug. 5!